Getting ready for a capsule wardrobe is harder than I thought, the main challenge is that there are so many things in my wardrobe that are relative new so I want to be able wear them when I can. I’m also a person that loves to have options so I wanted to have some “just in case pieces but I know I shouldn’t. For me the hardest part of organizing this wardrobe is that I had to learn to let go of things and be confident of what you picked . I don’t think I did a great job yet, but it is my first capsule wardrobe and I hope to improve as I go. 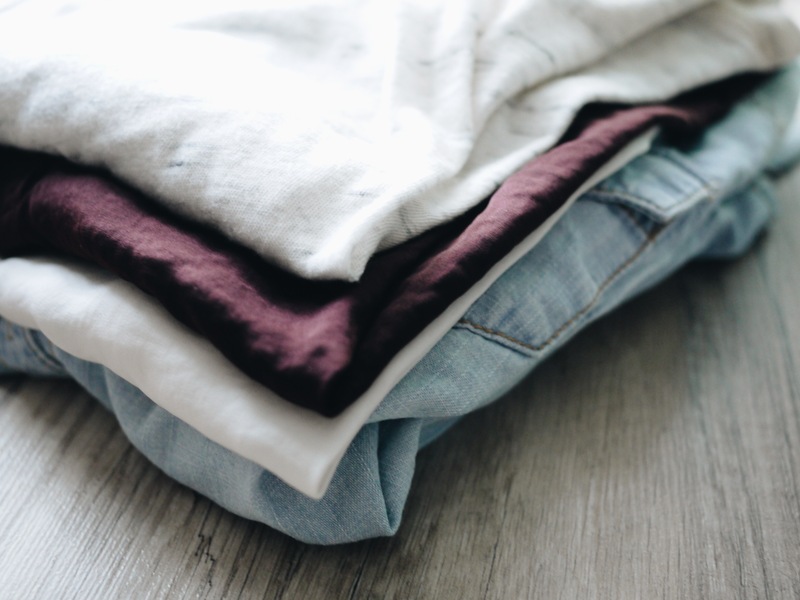 During the preparation of my capsule wardrobe, I notice I usually reach for the light grey, cream, off white, or darker rich jewel tone tops that has a comfortable fit when I’m in a hurry because they work with my skin color and make me feel confident even when I don’t have a lot of makeup on. So when I started to build my closet I picked items with these qualities as they’re the fail proof, look good and feel good colors I can depend on on the days where I just don’t feel pretty. I think this was an important realization because this helps me narrow down what I want in my closet and prevents me from buying items I think look great on the model but in real life never really fit my style. Here’s a basic rundown/overview of what’s in my closet, stay tune for some outfit posts on how I work with them! Most of my tops are in neutral tone or gray scale which is the easiest to dress for and mix and match. My tops are mostly plain or have very muted patterns, with a few stripes and a few plaid/flannel (where most of the colors come from) mixed into it. I’m keeping the pieces very basic, no crazy cuts or fits in my closet as I realize I never really reach for them because they’re hard to dress for. For this category, I’ll most likely be switching some of these jackets for my winter coats when December rolls around, but I will replace one for another so I can keep it the same count, and the ones I add in will be rolling over to my winter capsule wardrobe. For now, I have a few jackets from previous years that I will be rocking this fall, including 2 blazers, 2 vests, a zip up collarless jacket and some cardigans. I also have a casual jacket/windbreaker and a raincoat from The North Face for utilitarian purposes. For my bottoms I’m keeping things simple, other than the 4 new pair of jeans I got from Loft, everything else is what I already have, including a pair of lounge style sweat/track pants, a pair of shorts in case of warmer weather, a black midi skirt and some leggings. I’m also keeping a navy and yellow floral pattern pencil skirt out in case it’s warm enough during my visit to Atlanta for our homecoming game. 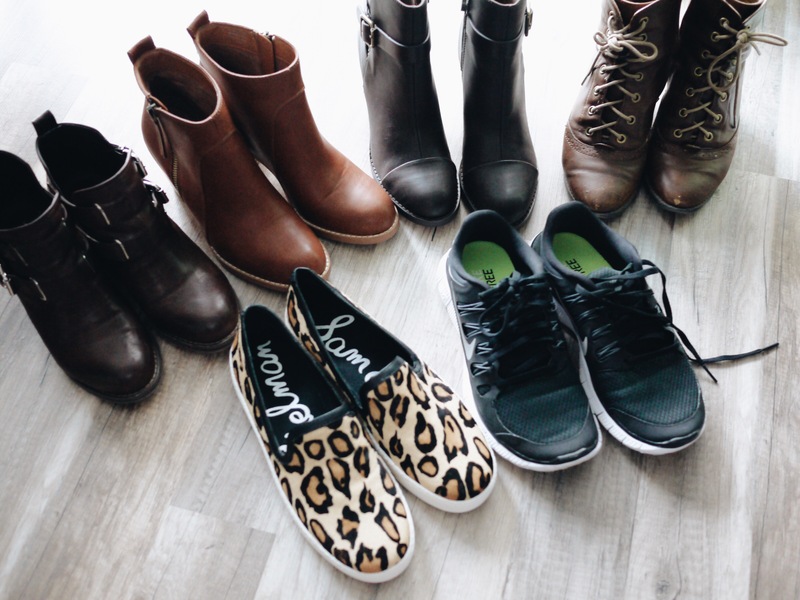 The main focus of my shoe wardrobe is of course – boots. There are 2 addition to my shoe closet this season as I mentioned here that my 2 go-to are falling apart (tho I’m not ready to let go yet…). I don’t have many flats included in my wardrobe because I haven’t found a pair that I think looks good on me in a long time, so I turn to the alternatives such as sneakers and slip-on since my work doesn’t require me to wear traditional (formal) office wear. I’m not sure which ones you’re referring to, but the one in the back second from the right is from Loft, and the one all the way to the left I got them when I was visiting home in Taiwan! They’re actually both a dark brown color tho (the ones from Loft are a super dark brown). Yes! You can get them online and in some stores I believe.